Do you spend a lot of time running the same types of mailing jobs and address correction processes? frameworks Command lets you set up jobs once and run them automatically, without the need for manual intervention, using a combination of Job Scripts and Command Line Action Scripts. frameworks Command then let you batch together a series of Job Script commands to form Action Scripts – which store the sequence of steps required to run complete jobs from start to finish – from import to presort. Using a Command Prompt Window, you can then run these Command Line action scripts and automate your workflow, saving you valuable time and ensuring consistency when you run the same types of jobs over and over! 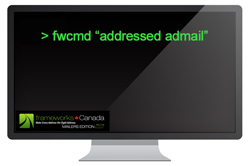 Click here to request a demo of frameworks Command in action. * Postal presorting available only with the Mailers Edition.